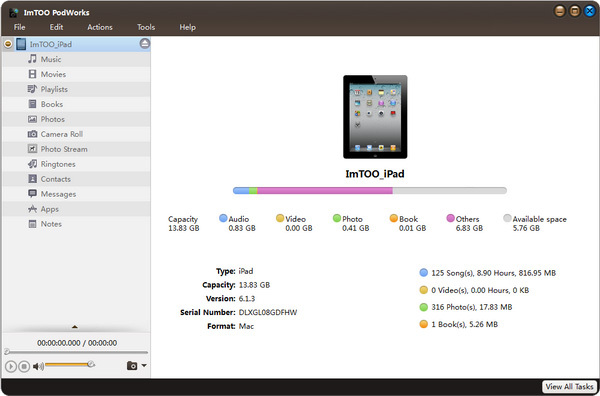 This is the tutorial for ImTOO PodWorks showing clearly how to transfer media files like videos, songs, photos, apps, sms etc between iPad/iPhone/iPod, PC and iTunes by ImTOO PodWorks. It is the solutions to all your Apple devices and the ultimate iTunes-alternative and upgrade. First, free download ImTOO PodWorks, install and run it. 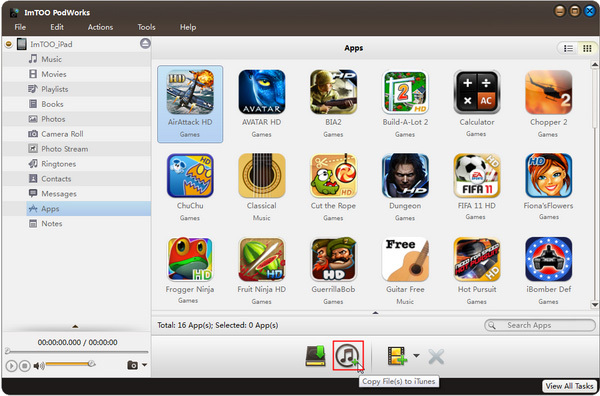 Connect your iPad/iPhone/iPod to computer, the application will recognize the device automatically and displays the device information in the interface. This program helps you copy movies, music, books, photos, eBooks, apps, messages, contacts, iPhone ringtones, etc from local folder to iPad/iPhone/iPod without overwriting original iPad/iPhone/iPod files. In the left directory tree, select the target device file list that you want to import files into. And then click "Add File(s) to Device" drop-down button, choose "Add File(s) to List..." option, select the files you want to add in the dialog box that appears, and load them to your device. 1. If you want to add a folder containing all files you want, please click "Add File(s) to Device" drop-down button, choose "Add Folder to List..." option, and then load the folder you want to your device. 2. 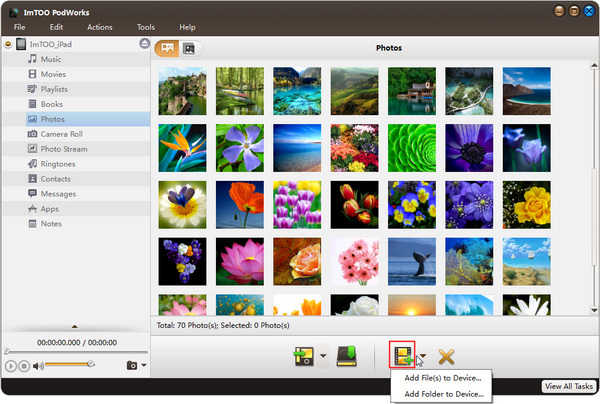 The program allows you to transfer files by drag and drop. You can directly drag and drop files from local into the program to import them. 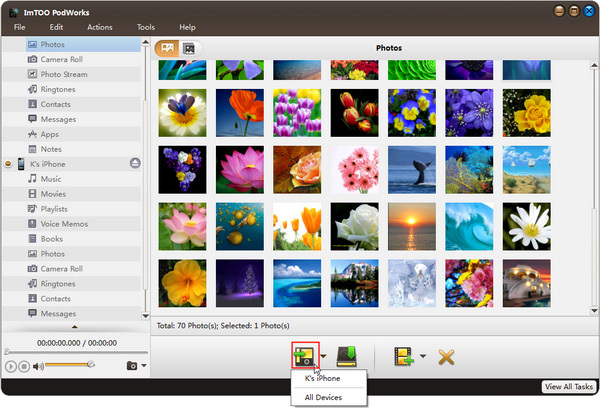 The program helps you transfer iPad/iPhone/iPod music, movies, books, photos, apps, contacts, etc to PC for backup. 1. In the left directory tree, choose the source file list from which you want to backup files to local. 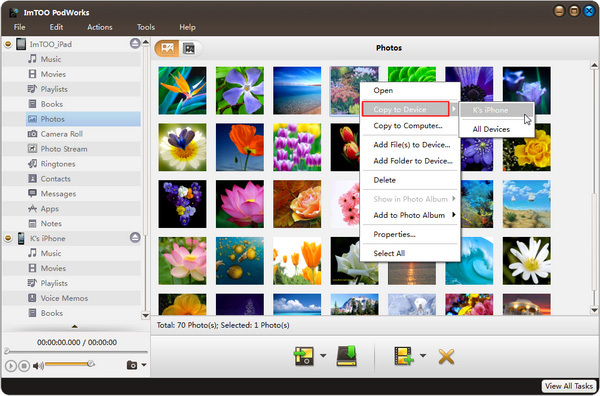 All files in the selected file list will be shown in the right list immediately. 2. 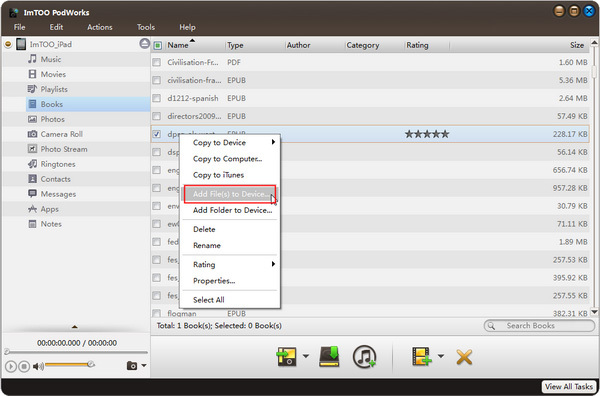 Check the wanted files in the right file list, click "Copy File(s) to Computer" button at the bottom of the file list, and locate the target folder in the dialog box that appears, then start exporting. 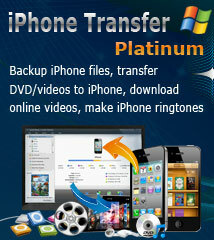 This program allows you to transfer iPad/iPhone/iPod music, movies and books to iTunes for backup. 1. In the left directory tree, choose the source music, movies and books list from which you want to transfer files to iTunes. All files in the selected list will be shown in the right file list immediately. 2. Check the wanted files in the right file list, click "Copy File(s) to iTunes" button at the bottom of the file list to start transferring. ImTOO PodWorks can connect several different iPad/iPhone/iPod simultaneously and transfer files between these devices. 1. In the left directory tree, choose the source music, movies and books, etc. All files in the selected list will be shown in the right file list immediately. 2. Check the wanted files in the right file list, click "Copy to Other Device(s)" button at the bottom of the file list to start transferring. Or right-click to find the drop down menu, and click "Copy to Device". (1) In the left directory tree, choose the "Contacts" which you want to export contacts to local. 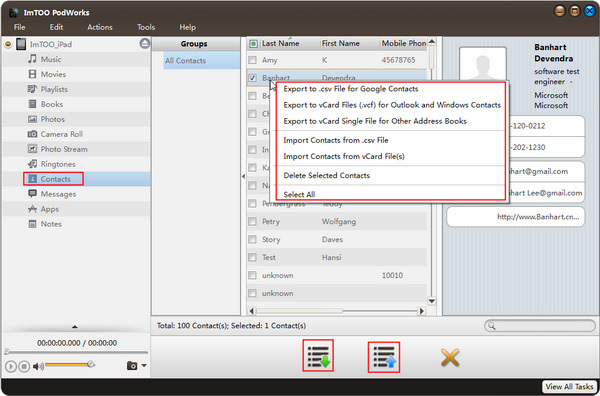 (2) Check the wanted contacts in the right list, then click "Export Contacts to Computer" button, choose "Export to .csv File for Google Contacts", "Export to .vCard File(s)(.vcf) for Outlook" and Windows Contacts" or "Export to vCard Single File for Other Address Books" option, and locate the target folder in the dialog box that appears, then start exporting. his program allows you to import contacts to device. (2) Click "Import Contacts to Device" button at the bottom of the interface, choose "Import Contacts from .csv File" or "Import Contacts from .vCard File(s)" option, and choose the source contacts file in the dialog box that appears, then start importing. 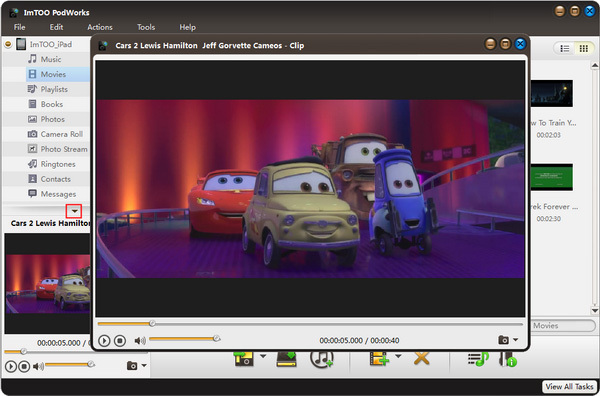 Comes with a built-in resizable media player to preview your iPod/iPhone videos/musics directly. The software supports document management for some applications. Select "Apps" node from the left directory tree, and choose an application which supports documents management from the applications list in the right file list. Click the up arrow button at the bottom to open "Documents Management" interface. Click "Add..." button to add local documents, choose the documents from list and click "Save..." or "Delete..." button to save or delete documents. You can add playlists to iTunes. 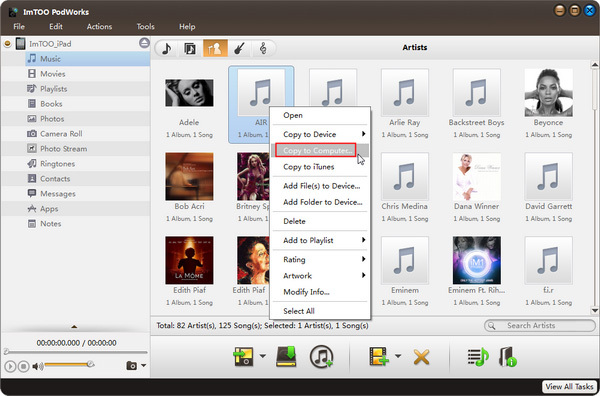 Choose one device node and click "Playlists", all the playlists will be displayed in the file list. Choose one or more playlists, and click "Copy File(s) to iTunes" to start copying. 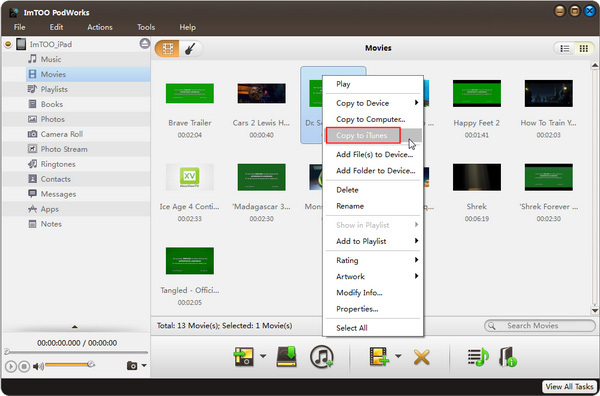 Choose one or more files in the file list, add the file(s) to other playlists by choosing "Add to Playlist" from right click menu. Right click the file which has been added to the playlist; choose one playlist the file belonged from submenu of "Show in Playlist", and then it will skip to the playlist automatically. Right click one or more media files in one playlist, and choose one playlist from submenu of "Move to Another Playlist", and then it will move to the target playlist automatically. How to convert Blu-ray to iPod? How to put movies on iPod? 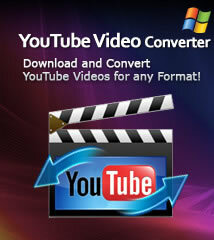 How to convert FLV video to iPod? How to watch movies on iPad?